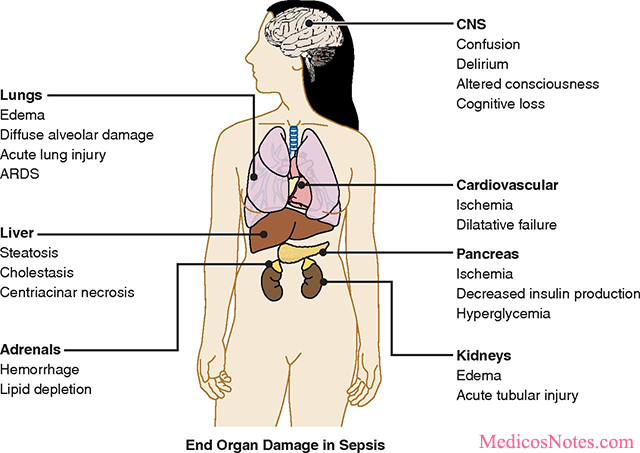 Sepsis is usually associated with multiple target organ dysfunction.Major complications are seen in cardiac, respiratory, renal, neurological and coagulation system. Ventilation perfusion mismatch (V/Q – mismatch) produces a fall in arterial PO2 early in the course of illness.Progressive diffuse pulmonary infiltrates and arterial hypoxemia (PaO2/FIO2, <200) are early indicators of the development of the acute respiratory distress syndrome (ARDS). ARDS develops in ~50% of patients with diagnosed with severe sepsis or septic shock. This is manifested as increased end-diastolic and systolic ventricular volumes with a decreased ejection fraction.Myocardial suppression develops within 24 hours in most patients admitted with severe sepsis. ATN, acute cortical necrosis, interstitial, nephritis, or drug induced damage are the major renal complications in sepsis.Most cases renal failure is occur secondary to acute tubular necrosis (ATN) induced due to hypotension or capillary injury. Drug-induced renal damage may also complicate therapy, especially when hypotensive patients are treated with aminoglycoside antibiotics.Oliguria, azotemia, proteinuria, and nonspecific urinary casts are frequently found. Thrombocytopenia is seen in 10–30% of patients, the underlying mechanisms are not clear.In patients with DIC the platelet counts are usually very low (<50,000/L) ,this low counts may be secondary to diffuse endothelial injury or due to microvascular thrombosis. Critical illness polyneuropathy is the most common neurologic complications.This is commonly seen when the septic illness lasts for weeks or months, problem due to "critical-illness" polyneuropathy is that it may prevent weaning from ventilatory support and patients experience distal motor weakness.Electrophysiologic studies are helpful to rule out other conditions such as GBS , metabolic disturbances, and toxin activity .